Cansu Tanrıkulu: Voice; Declan Forde: Piano; James Banner: Bass; Max Andrzejewski: Drums; Fabiana Striffler: Violin; Arne Braun: Guitar. 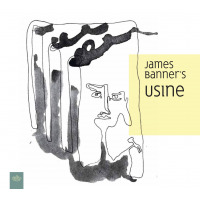 With USINE, British bass player and composer James Banner brings together a collection of European improvisors - all well-established in their own right - to create a sometimes homogenous, sometimes disparate sound-world. The inspiration comes via composed themes based on reworked improvisations, multi- lingual texts that are song, spoken and screamed, as well as the ever-changing world of literature, art, and politics in the twentieth and twenty-first centuries. At the core of USINE, the golden thread of the composed runs alongside improvisational freedom, with an appreciation of both the rich history of acoustic jazz music and a recognition of the value that each individual musician and their unique geographical and cultural experience brings to the table. These 13 tracks create an environment in which these six friends and voices from Berlin’s rich improvised music scene can shine, at the same time fusing them into one single USINE.